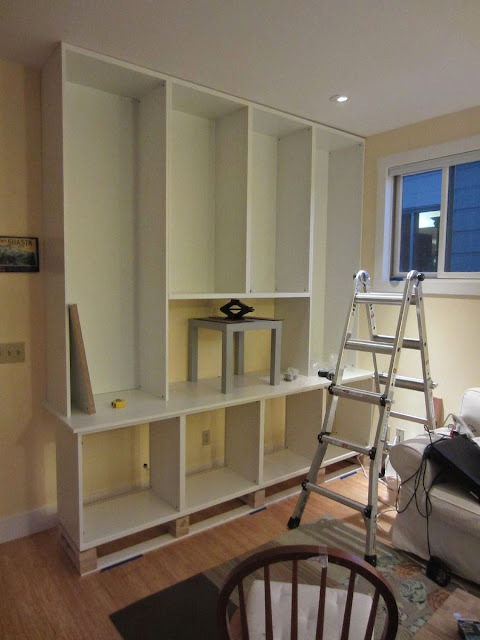 Description: This is our latest IKEA hack (we previously built a built-in using BESTAs and PAX, pix below). We built an integrated wall of shelves and cabinets using only BESTA shelves (fits into an 8 foot wide by 9 foot tall space). 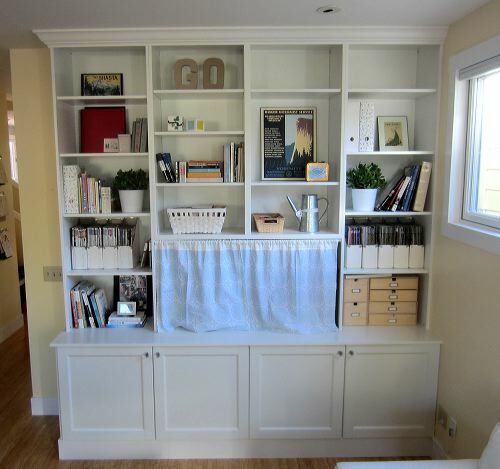 It has the look of substantial base cabinets and counter with shallower bookshelves on top. 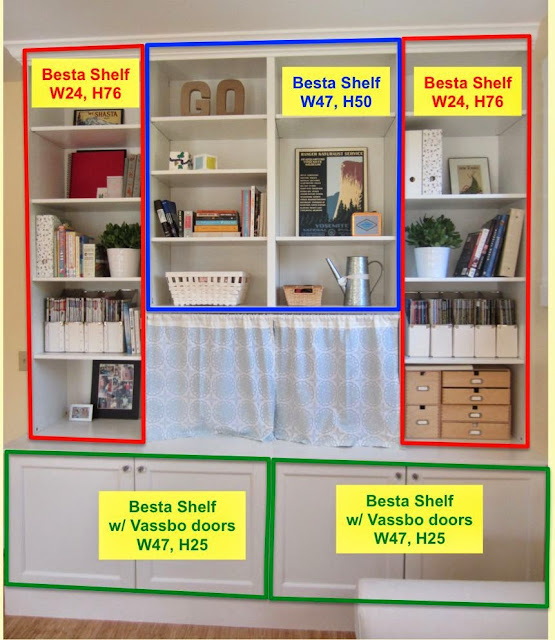 The lower “cabinet” is just a set of lower BESTA shelf unit with doors that is pushed out further from the wall (~7 inches). They are installed on a riser so that the baseboards fit underneath the doors. The lower cabinet is topped with a countertop made of two 1x12s attached together. We installed two tall side shelves (skipping the install of the bottom panel and installing the cam lock screws directly into the countertop, using the shelf bottom as a drill template). Then we installed an upper shelf unit between the two side shelves and screwed the whole thing together. The area underneath the middle shelf unit is where the TV resides (behind the curtain). A side panel was installed to cover the gap behind the base cabinets. Baseboards and crown molding are also installed to complete the built-in. We are very happy with how the hack turned out. Total cost was around $700 and the project took around 15 hours. See more of the Besta built-in TV bookshelf.